Founded by the Graham Companies in the 1960's, The Town of Miami Lakes was developed as a master planned community. Out growing its farm town roots, the Town of Miami Lakes eventually incorporated as its own city, on December 9, 2000. Miami Lakes is located in Southeast Florida, in the Northwest section of Miami Dade County. As its name implies, Miami Lakes is known for its beautiful tree lined streets, magnificent homes, and its neighborhood lakes. Apart from the activities noted, the Town of Miami Lakes offers 101 local community parks, 3 community centers (including 1 dedicated youth center), 6 lake front beaches, and a fresh water marina. Within its park system, the Town of Miami Lakes offers year round soccer, baseball, football, and archery. Its parks programming also offers specialized classes for young and "young at heart" including; tai-chi, yoga, computer classes, arts and crafts, table tennis, duplicate bridge, dominoes, canasta, Spanish, and "A Matter of Balance". Located within the Town, Shula's Golf Course offers a professionally designed golf course with instructors and classes for all skill levels. The Town of Miami Lakes offers a uniquely designed play ground for those whom are limited in mobility. The Mathew Palacios Playground was uniquely designed to meet the needs of all children regardless of their limitations. The Town of Miami Lakes is a family oriented community with year round programming. The Town of Miami Lakes Cultural Affairs Committee programs over 50 events throughout the calendar year, FREE of charge for its residents. Apart from the transportation offerings noted, the Town of Miami Lakes also offers its circular "Moover Bus" service, and for its FREE senior door to door bus service. The Town of Miami Lakes is centrally located to major thoroughfares that offer ease of access to major hospital and medical providers within minutes. The Town of Miami Lakes is adjacent to 2 large health care systems, Tenet Health Systems, and Memorial Health Care Systems. Apart from the 2 nearby hospitals, the Town of Miami Lakes has located within its boundaries; an urgent care center, a long term acute care facility, hospice service providers, out-patient practitioners/medical centers, home care providers, dialysis center, physicians with a wide range of medical specialties, and imaging services. Jan 61.3 F° 69.3 F° 77.2 F° 2.2 "
Feb 62.6 F° 70.3 F° 78.0 F° 2.2 "
Mar 66.4 F° 73.7 F° 81.0 F° 3.0 "
Apr 69.2 F° 76.6 F° 84.1 F° 3.7 "
May 73.5 F° 80.5 F° 87.6 F° 5.9 "
Jun 76.6 F° 83.3 F° 89.9 F° 9.6 "
Jul 77.8 F° 84.8 F° 91.8 F° 6.6 "
Aug 77.8 F° 84.7 F° 91.7 F° 9.0 "
Sep 76.9 F° 83.5 F° 90.1 F° 8.7 "
Oct 73.2 F° 80.0 F° 86.7 F° 6.5 "
Nov 68.9 F° 75.6 F° 82.3 F° 3.7 "
Dec 63.8 F° 71.2 F° 78.5 F° 2.5 "
The Town of Miami Lakes enjoys its beautiful South Florida climate, with year round sun, and perfect outdoor weather. Condos Over 50 Communities The Town of Miami Lakes is a master planned community with a wide array of housing options. From lushly landscaped single family homes, to garden condominiums, and rental communities, the Town of Miami Lakes offers an option for everyone. Home care Senior center Visiting nurses The Town of Miami Lakes through its Elderly Affairs Committee offer year round programming for its seniors, including social gatherings, educational programs, field trips, health and wellness events, leisure activities, and sporting events. 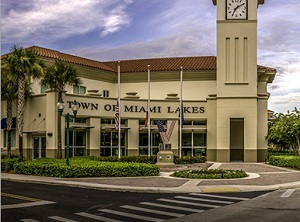 The Town of Miami Lakes has a bustling downtown/corporate center with opportunities for commercial development, and employment. Specifically for seniors, various community organizations and groups offer employment specific for seniors or those in retirement years. The Town of Miami Lakes offers volunteer opportunities for its residents through its committee and special events programming.